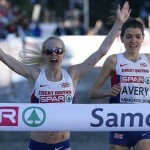 Samorin – Harriet Knowles-Jones gave Great Britain a glorious start to the European Cross Country Championships, finally landing the individual gold medal that she has spent the winter aiming for. After winning silver in Hyeres in 2015 and bronze in Chia last year, Knowles-Jones – in her final month as an U20 runner – completed the set in tremendous fashion. And her brilliance led her nation to team gold in the opening event here as Knowles-Jones won in 13:48 from Hungary’s Lili Anna Toth in 13:59 with Germany’s Mariam Dattke (14:03) outsprinting European U20 5000m champion Jasmijn Lau from the Netherlands (14:05). Staged on a glorious sporting complex at the x-bionic sphere, which is the official Olympic training centre in Slovakia, Knowles-Jones, 19, used all of her experience to make it to the top of the podium in the individual event over 4.18km. Even though the sun shone, temperatures at the start were -3 and it was not long until the race took on its decisive shape. Dattke had won 5000m silver in the summer at the European U20 Championships in Grosseto, beaten then by the Lau and the pair made an early impression in a group that included Switzerland’s Delia Sclabas who has had a fine winter. On a course which was far from easy, with a series of man-made climbs and a small water jump which was iced over, making conditions even trickier, Knowles-Jones was the most fluent of the leaders. Her shoulders never dropped and with a lap to go she was in front, always looking to break further ahead – perhaps with memories of how close she was to gold in 2015 when Germany’s Konstanze Klosterhalfen beat her by four seconds. Not this time. It was all about Knowles-Jones and gradually she increased her advantage on a course where after the final lap of 1500m, there was a 70m run-in to the line. Toth had initially slipped outside of the leading trio but she came back superbly to take silver and said. “I am very satisfied because I got injured in Grosseto where I wanted to get gold,” she said. 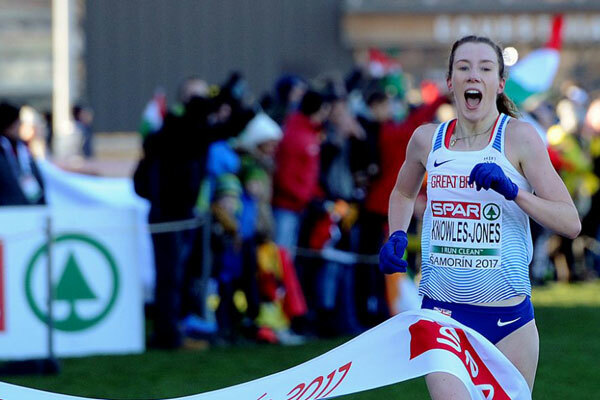 Undeterred by her bronze last year, Knowles-Jones came back in style as she leaves Slovakia with double gold after a team success which saw fellow Briton Cari Hughes in ninth (14:15) and Khahisa Mhlanga in 11th (14:16) for 21 points. With 104 runners from 26 nations, Italy won team silver with 33 points led by Nadia Battocletti (14:07) in fifth while Spain won bronze with 47, with their first runner home being Marta Garcia in 13th (14:17).